/ Modified dec 6, 2012 2:59 p.m.
Lama Ngawang Kunga Bista, a Buddhist monk from Lo-Mustang, Nepal, recently spent a week in Tubac, where he created a sand mandala dedicated to medicine and the healing arts. A mandala is an intricate, colored sand design made painstaingly by hand and then swept away in minutes. 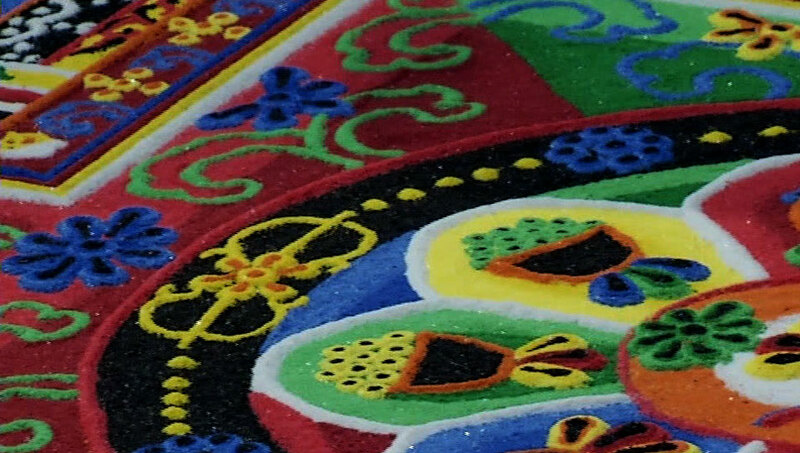 Bista says the sand mandala is an important component of the Tibetan Buddhist philosophy, and the intricate designs date back thousands of years. “This is a 2,600 year-old tradition,” says Bista. This is only the second mandala created by Bista in the United States, and he says this particular design is inspired in part by the addiction problems that he sees afflicting the country and other parts of the world. The medicine mandala is part of an exhibition at the Tubac Center of the Arts, a non-profit art collective in the small community along the Santa Cruz River valley south of Tucson. Karon Topping, director of TCA, says the exhibit is titled Timeless Meditations: Mandalas and Patterns in Nature, and Bista’s creation of the sand mandala is a first for small community of Tubac. Topping points out that Bista is traveling to raise awareness and funding for needed education in Lo-Mustang. Bista is responsible for the creation of two schools in his homeland through the work of the Lo-Mustang Foundation. He’s also helping villagers cope with new challenges in farming conditions due to climate change. His sand mandala has been erased in a dissolution ceremony, keeping in line with the Buddhist belief in the transitory nature of material life. Bista deposited the mandala sand in the Santa Cruz River, where he says the healing powers will be spread throughout the region.